Chili peppers are well known for their pungent flavor that adds a spicy kick to the world’s culinary arsenal, from subtler Szechuan recipes to flaming hot Thai cuisines. According to WHFoods.com, chili peppers are berries that belong to the Capsicum family. Chili peppers vary in size and flavor intensity, and are usually red or green in color. Among the most popular varieties of chili peppers are habanero, jalapeno, ancho, and chipotle. Chili peppers are available all-year round. Chili peppers are best known for their weight loss properties, thanks largely to a compound called capsaicin. Previous research revealed that capsaicin promoted weight loss by accelerating fat metabolism and reducing caloric intake during meals. The compound, along with the superfood’s other potent nutrients and antioxidants, helped stave off diabetes. Likewise, the high potassium and folate content in chili peppers significantly curbed blood pressure levels, relaxed blood vessels, and boosted blood flow. The abundant vitamin C supply in chili peppers are found to bolster the body’s immune system too. Chili peppers are known to fortify the body’s resistance against infectious agents and rid the body off cancer-causing free radicals. Aside from this, chili peppers are loaded with copper and iron that facilitate the formation of new blood cells. This in turn reduces the risk of anemia, muscular weakness, and fatigue. 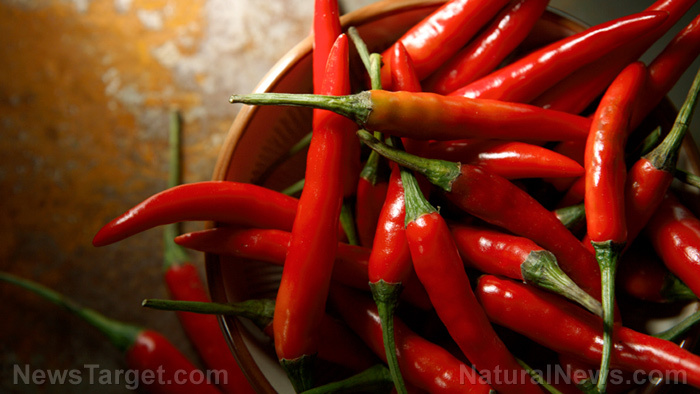 In addition, chili peppers are touted to improve eye health as well as skin condition. Chili peppers are significantly beneficial to the cardiovascular, circulatory, digestive, and immune systems. The spicy superfood also supports the brain and the nervous system. Likewise, chili peppers are essential to the eyes and skin. Chili peppers are a popular flavoring in many meat dishes. The spicy superfoods can also be incorporated in a variety of finger foods, dips and sauces. Some recipes for sweets and preserves may even call for chili peppers to add an extra zing to the flavor. AllRecipes.com features some interesting chili pepper recipes curated across the web. Chili peppers prevent heart disease, diabetes, and anemia, as well as muscular weakness and fatigue. Chili peppers also stave off Alzheimer’s disease, dementia, and Pellagra. Chili peppers are beneficial to the cardiovascular, circulatory, digestive, and immune systems. 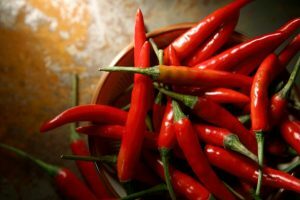 Chili peppers support the brain, eyes, and skin.